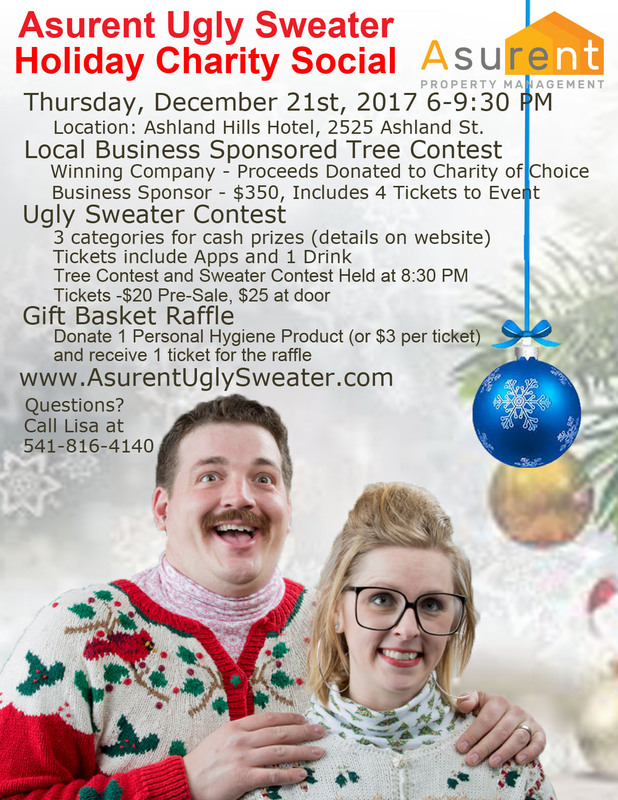 Join us for the First Annual 2017 Asurent Ugly Sweater Holiday Charity Social! Asurent Property Mgt has partnered with Access for an Ugly Sweater Holiday Social! The event date/time is December 21st, 2017 from 6-9:30 pm. Event location is The Ashland Hills Hotel. 2525 Ashland St. Ashland, Oregon 97520. Join us for live music, food, fun and give to a great cause! Items to Donate (New Only): Socks, contact solutions, toothpaste, mouth wash, shampoo, conditioner, body wash, soap, shaving cream, toothbrushes, combs, razors, deodorant, etc. Local businesses have an opportunity to give to a great cause and to get their name in the public via our Local Business Sponsor Tree Contest. Local business can contribute $350, (includes 4 tickets) and will have an opportunity to enter a tree in the contest. Businesses will have the full day to decorate their tree at the location prior to the event. At the event, all local business tree sponsors will have their logo in front of the tree as well as on a power point cycling through sponsors at the event. The Best Christmas tree contest will be voted on by all attendees throughout the night. The winning local business will have their proceeds donated to a charity of their choice in their name. The winning christmas tree contest, ugly sweater contest and raffle prizes will be announced promptly at 8:30pm. Buy your tickets below! If you can't make it to the event, but still want to donate to Access, then click below and give what you can!